Specifying your vehicle and its related features is absolutely necessary. Without specifying the correct volume of the fuel tank for instance the calculations can not be more than half precise. When you start the application for the first time , you will enter most of the data. If you have multiple vehicles – you can go to the vehicle list by selecting “My Account.” on the main menu. Just click on the icon of the car in the main menu. Any of the above ways will lead you to the following edit screen settings of your vehicle. Name– Do not overdo it with the length – the name appears quite often on your already small gadget screens. Comment– ship you comment, so it will float. I mean go. Distance* – kilometers / miles – it makes sense to choose the one, which is shown on the real odometer in the car. Recording method specified – if you do not reset the odometer each refueling, select it, if resetted each time- then it is a counter. 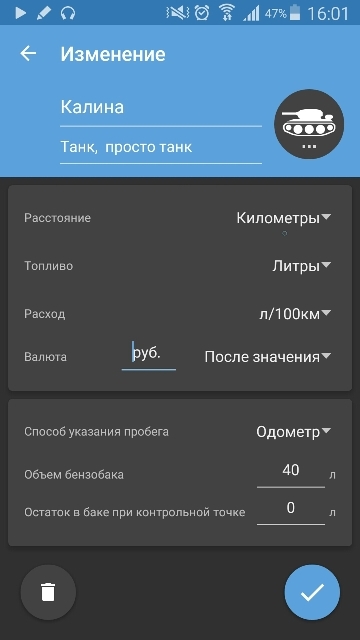 Fuel tank capacity** – важнейший параметр, который легко гуглится. The residue in the tank at the reference point* – подбирается опытным путем, тут подробнее. * – marked fields are not subject to be altered “on the fly” – statistics becomes inconsistent and “breaks”. ** – clarification of the scope of the gas tank on the “guaranteed true” only improves the statistics.